Did you know that during the filming of Friends, they would sometimes keep a second camera *just* on Lisa Kudrow’s character Phoebe? Because Lisa Kudrow is amazing. You wouldn’t want to miss a split second of her facial expressions or impeccable physical comedy. If they didn’t have a camera on her and they missed a genius moment, that’d be the worst, right?! Short answer: yes. Yes, that’d be the worst. And we wouldn't have the Phoebe that we know and love today. So Allea, this is related becaaaause? Because if you don’t keep an eye on your money, you’ll miss something. That’s the truth of it. I know it sounds very “Big Brother” to track your money, but guyyyys how much do we actually spend at Target? And on what? We rarely know, which is why it’s important to track our expenses. By tracking your expenses, you can have fun and also be prepared to cover unexpected expenses. I know I can pay my rent *and* go to yet another Needtobreathe concert. That's the freedom of having a budget. Do a favor for Future You. Can I cut back on my spending? By tracking your spending, you’ll actually see how much you’re actually spending. Like, not an estimate — you’ll see what actual dollars are being spent. I track my spending for personal accountability. I use Mint.com. It syncs with my bank accounts, so if a $12 charge from Walgreens pops up, I have to recall what that charge was for. It wasn’t for nothing, so I make sure to categorize it correctly (let’s be honest, it’s for snacks). If your “means” is an income of $2000 each month, it's considered “living within your means” if you spend equal-to or less-than $2000 each month. If you’re spending $2100 each month, you’re not living within your means. You’re spending $100 more each month than what you can actually afford. If you do this month-after-month, you’ll develop a “deficit,” where you won’t have enough money to pay for the things you’re used to buying or having access to. You can only dip into savings so many times before your savings will dry up. It’s easier to cut back on your spending to avoid this happening, making sure you’re not spending more than $2000 each month. Tracking your expenses allows you to see for yourself where your dollars are going. You’re allowed to Choose Your Own Adulthood. I like vanilla lattes as much as the next #basic girl in her 20’s with a topknot and an iPhone, so I buy them sometimes. Categorize your transactions by what you’re spending your money on. Some folks like to do this by going through and looking at their bank statements each month. Y’all, I ain’t got time for that. Once you start tracking your expenses, Mint will remember most of them. You can also create custom “rules” — you know, so that every transaction from “Taylor Swift Merch” gets categorized within your “Fangirl” budget. Best part? You can also split transactions. Unlike spending money at HyVee Gas where I know the whole transaction is for Gas & Fuel, it’s an absolute crapshoot when I spend money at places like Target, Walgreens, WalMart, TJ Maxx and Amazon. I make sure to keep my receipts for those purchases so I can split up a $150 transaction in Mint based on what I purchased. It sounds meticulous, but it’s accurate. If I don’t categorize the transaction in my Mint account, it would really skew what I think I’m spending my money on and what I’m actually spending my money on. I had to make a change when it came to this holy grail of end-cap sales and cheap shoes. Though I love seasonal discounts and boots for 50% off, I often spent more at Target than I wanted to — and certainly more than I needed to. So I made a change. Based on the floor plan of my neighborhood Target (seriously, only 11 blocks away), the Starbucks and the women’s clothes and shoe section were all to the left. So you know what I did? I stopped turning left. I made a conscious choice that if I wanted to go to that part of the store, I’d need a really good reason. No more mindless shopping, no more $5 v-neck t-shirts, no more excessive spending. And it worked! I have spent way less on crap I don’t need at Target, now that I’ve put that “rule” in place. Is there somewhere you go that you just know you’re going to overspend? Perhaps it’s a restaurant or a boutique, a sports bar or a bookstore. You don’t have to stop going there (and I’m not your mom, so you don’t even have to listen to me), but it’s worth reviewing your spending to consider if certain places are disrupting your bigger financial goals. Tracking your expenses will also hold you accountable for any unnecessary spending. I mean, what’s the point of paying for cable if you’re not watching it? Or Netflix? Or Hulu? Even if subscription charges are cheap, they add up. If you’re not using the service, stop paying the servicer. Also, on this topic: Ugh, those monthly subscription boxes. Whether it’s a box of razors and aftershave or new beauty products or jewelry or vinyl records, it’s probably unnecessary. My degree is in advertising. I know that businesses use subscription models so you forget how much you’re spending over the course of a year or more. It’s one thing if you absolutely love the products — and use them — but otherwise, is the product filling up your home and collecting dust? You may notice that you’re spending more in one category than what’s necessary. If you have bigger goals in mind, you can cut back on spending in some categories without causing too much harm to your lifestyle. For instance, I used to spend $150 each month on groceries, but now I spend closer to $120. That difference allowed me to move into a different house where I knew my utilities expenses were going to be higher. Sure, it’s “only $30," but the cost difference for utilities needed to come from somewhere in my budget. Spending less on groceries hasn’t put a cramp in my diet — it just means I have less uneaten food in my pantry or fridge. I’m better at eating what I have before it spoils, plus I plan my meals and make sure to use the food I already have in the pantry before buying more. Bad guys are out there. Keep an eye out for charges that look suspicious. By tracking your expenses, you’ll be able to pick up on any fraudulent charges to your accounts. It's possible for someone to hack into your online bank account or steal your credit card information. Also watch out for additional charges from vendors who already have your credit card information. One time, my gym charged me an additional $80 one month — some annual charge that didn’t apply to me — uh, nothankyou. All it took was a call and I got my $80 refunded. If I hadn’t noticed the charge, I would be $80 poorer right now and not even know it. In another case, I went out to eat with friends only to see on my bank account later that my card was charged $22, instead of the $12 I actually paid for the meal. It took some sorting out with the restaurant, but ultimately it was an error with the credit card so the difference got refunded. It might seem like a few dollars here and there, but I’d prefer to keep my dollars where I can spend them on what I want. I think that the way you spend your money is a reflection of what you value most. Or, at least it should be. If you look at your expenses and feel differently about what you value than what your spending shows, then change your spending. Do you have recurring expenses for things that you don’t really care about or need? Now is a good time to reevaluate. The goal is to be conscientious of our spending and making our choices deliberately, whatever those choices may be. When you start tracking your expenses, you may be surprised by how much you’re spending on certain things throughout the month. That's normal. Start by tracking your expenses for a few weeks or a month, then base a tentative budget based on your current spending. As you track expenses for the next couple of months, adjust your budget to reflect what’s realistic and in line with your bigger financial goals. You may even set new goals and cut back spending in some areas that seem less important than others, now that you have a new perspective on your money. How about you? 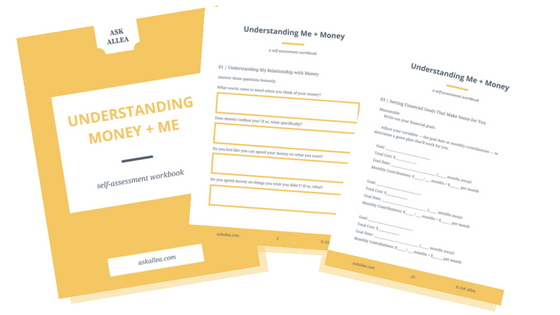 Do you feel like your expenses are a reflection of what you value most? 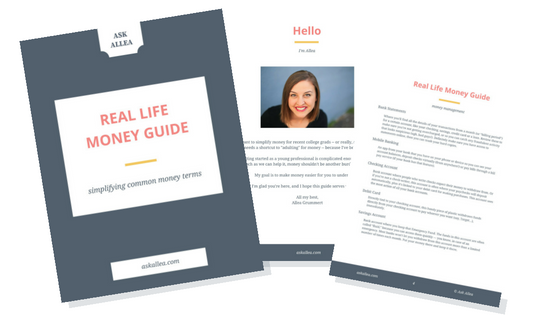 Answer important questions about your relationship with money, see how you're spending your money and identify how to reach your goals (realistically! ).